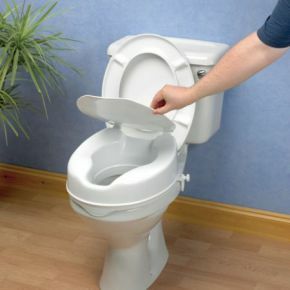 Our popular range of stable, economic raised toilet seats has been expanded to include all three heights with lids. 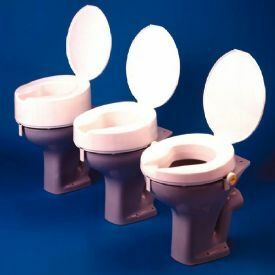 Versions of the Savanah raised toilet seat with the added refinement of a moulded plastic lid to create a more pleasing and normal appearance. The large front and rear cut outs aid personal cleansing, and as it slopes gently from back to front enables easier raising and lowering onto toilet. Secured to the toilet by two plastic brackets with fluted turning knobs and can be easily adjusted to fit most types of toilet. can be fitted and removed very easily. Great quality toilet seat , very sturdy, I purchased this as I had relatives coming to stay with mobility problems and it was easy to fit and easy to remove. Also very quick delivery !